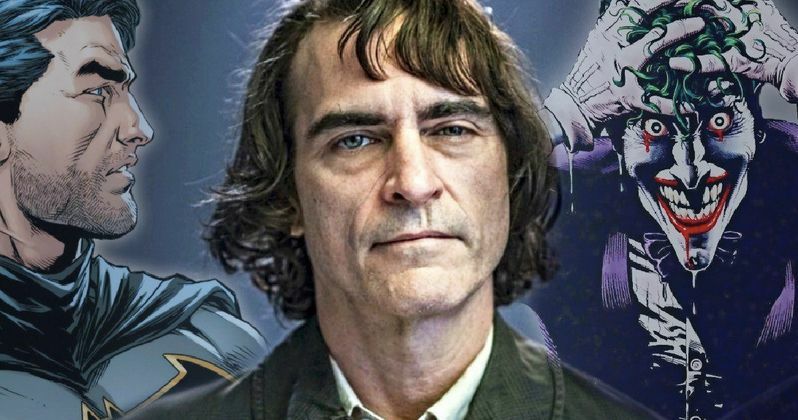 Warner Bros. has officially announced the full cast and crew for the Joker origin movie. Filming recently got underway on the DC movie, which, as this new information confirms, will stand alone and be a totally new story that hasn't been put to screen in the past. Joaquin Phoenix is on board to play the man who will ultimately become the famed villain. His character is named Arthur Fleck, as revealed in the first official photo, which was released by director Todd Phillips on Instagram over the weekend. That information was reaffirmed in the release by the studio. Beyond that, we got confirmation on the full cast. Aside from Joaquin Phoenix, the ensemble includes. Zazie Beetz (Deadpool 2), Bill Camp (Molly's Game), Frances Conroy (Castle Rock), Brett Cullen (Narcos), Glenn Fleshler (Barry), Douglas Hodge (Red Sparrow), Marc Maron (Glow), Josh Pais (Going in Style), and Shea Whigham (Kong: Skull Island). They also confirm that Oscar-winner Robert De Niro will star in the movie. A handful of these cast members had been reported previously, with Cullen recently taking over for Alec Baldwin in the role of Thomas Wane. But others, such as Camp and Hodge come as surprising new additions. For the time being, specific character info for many of the actors is pretty much non-existent. But Conroy is said to be playing Arthur's mom and Beetz will be playing a love interest of sorts. When news of the Joker movie first broke last year, it was reported that Martin Scorsese was going to be on board as a producer. His name isn't mentioned in the release, so it looks like that didn't ultimately come to pass. But Bradley Cooper is listed as a producer, which is a little unexpected. But he and Todd Phillips are producing under their company Joint Effort, with Emma Tillinger Koskoff also on board. Since Phillips and Cooper worked together on The Hangover trilogy and War Dogs, they seem to have a good working relationship. Executive producers include Richard Baratta, Joseph Garner and Bruce Berman. As for the crew working behind-the-scenes on Joker, the studio has assembled an accomplished group. The crew includes director of photography Lawrence Sher (Godzilla: King of the Monsters, The Hangover trilogy), production designer Mark Friedberg (Selma), editor Jeff Groth (War Dogs) and Oscar-winning costume designer Mark Bridges (Phantom Thread). While no synopsis was released, Joker is described as the story of a man disgraced by society that serves as both a gritty character study and a cautionary tale. Since this takes place outside of the DC universe continuity, and since the character doesn't have a well-defined origin story, the Todd Phillips and script co-writer Scott Silver (8 Mile) are going to have a lot of room to play here and craft a new story. It will be fascinating to see how this all turns out. Warner Bros. is set to release Joker in theaters on October 4, 2019.